A table or altar for communion at the front of the church, where the bread and wine/grape juice for communion are prepared for the service. Catholic and Orthodox churches will always use wine, as transubstantiation (in which the gifts become the actual body and blood of Christ) is only valid with wine. Many Protestant churches use grape juice instead. 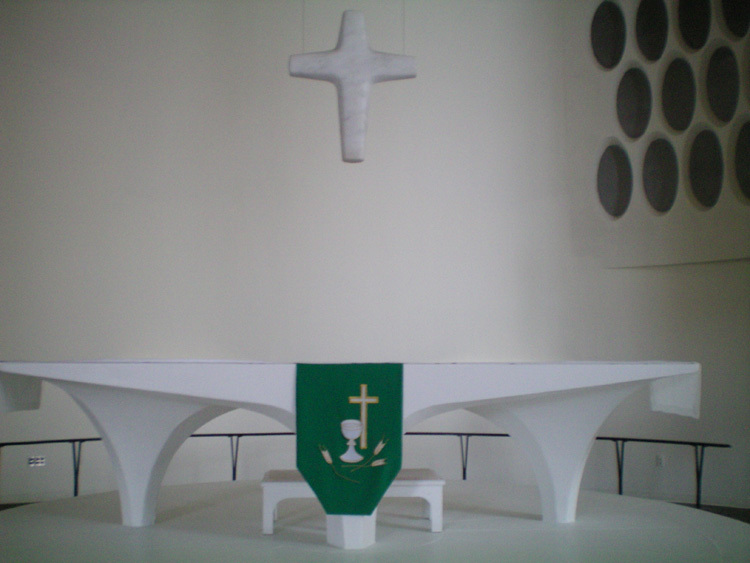 Catholic and Orthodox churches use an altar, while Protestant churches use a table. A pulpit - also found at the front, used by the clergy or lay leaders for reading or preaching. However, a pulpit will usually not be used in Eastern churches. The Apostolic Reading, or lay reading, is intoned from the aisle, facing toward the altar. For the Gospel Reading in Eastern churches, the priest or an altar server will hold the Gospel Book while the priest reads from it. A baptismal font -for baptism ceremonies. Some kind of decoration - paintings, stained glass windows, etc - depicting different symbols of Christianity, such as a fish, bread, a goblet, a cross, or a lamb. 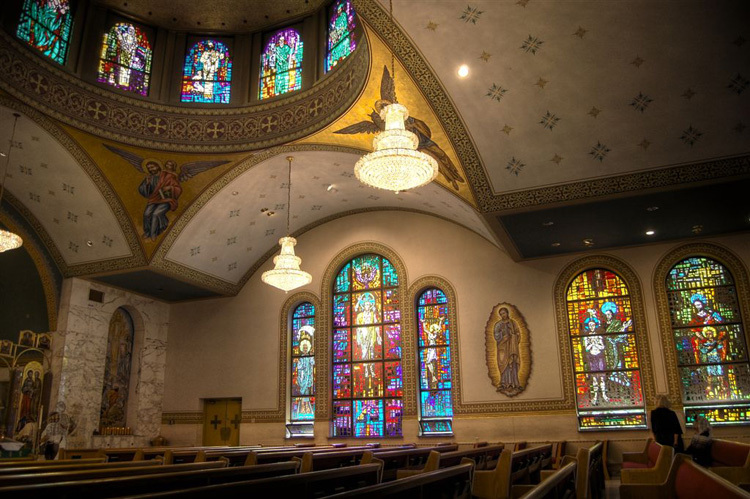 Occasionally, in Catholic churches, these paintings or windows are meant to illustrate teachings and parables from the Bible, or specific events/miracles from Jesus' life. In the Middle Ages, these decorations came to be known as a Poor Man's Bible. Churches can be broken down into three sections: the narthex, or the entrance; the sanctuary, where the congregation sits, stands, or kneels during the service; and the chancel, the altar and head of the church. The sanctuary may also refer to the area around the altar, while the area where the congregation is may be called the nave. In the Eastern Orthodox Church, the altar is called the Holy of Holies. While many Christian churches are still built in the traditional styles, such as Gothic or Classical, others are built in styles that reflect the time of their construction, such as Victorian or Georgian, and many rely on more modern architecture. A recent trend is to build round churches. On the outside, churches draw the eye upwards, with tall towers, steeples, or domes. While Jesus lived in the very beginning of the first century CE, Christianity was not legalized until the fourth century CE with the Edict of Milan in 313. Until that point, Christian churches in the Roman Empire were not unified about official Christian doctrine regarding several topics. The Council of Nicea was called in 325 CE to settle disputes about a trend known as Arianism, whose beliefs were considered by many to be heretical. The council settled several theological issues, such as the exact nature of the relationship between Jesus and God, fixed the method for determining the date for Easter, and wrote the beginning of the Nicene Creed, which lists the basic tenets of the faith. While the council did not immediately fix all the problems, the Christian Church continued relatively intact, until 1054, when a split occured between churches in the East, who spoke Greek, and the West, who spoke Latin. The main issue was the exact nature of the Holy Spirit in the Trinity, what became known as the "Filioque clause" (...and the Son). The Latin text of the Nicene Creed, decided at the Third Council of Toledo in the 6th century, declared that the Holy Spirit proceeds from both the Father and the Son, whereas the original Greek text determined at Nicea, used in Eastern churches, stated that the Spirit only proceeds from the Father and through the Son, and Eastern churches would not recognize the Latin changes to the text. There was also debate about the role of the Pope and whether leavened or unleavened bread should be used for communion, all leading to the East-West Schism, which created two distinct churches: what came to be known as the Western Roman Catholic Church and the Eastern Orthodox Church. About 460 years later (1517), a Catholic priest, Martin Luther, sent his 95 Theses to the bishop of the German territory where Luther lived and preached, objecting to the sale of indulgences, although some scholars and historians contend that Luther actually nailed the 95 Theses to the door of the church. A common misconception is that Luther nailed them to the church door in an act of rebellion, to get attention. However, it should be noted that this was not meant as a rebellious act. In fact, the church door served as a kind of message board, where people posted announcements or other important documents, so if he did nail them to the church door, it was not seen as a radical act at the time. Luther did not intend to start a new branch of Christianity or break away from the Catholic Church. Initially, he wanted to help reform the church, which he saw as corrupt and having moved away from Christ's original teachings. Following Luther's excommunication in 1521, however, the Protestant Reformation was unstoppable, by either government or Rome's authority. Several new branches of Christianity came out of the Reformation, such as Lutheranism and Presbyterianism, which vary in how much they differ from each other, as well as Catholic doctrine. Many Protestant leaders also emphasized simplicity in church decoration, opposing decoration that depicted God or Jesus, as they are forbidden in the Ten Commandments. In some Protestant churches, although not all, the pulpit will be centrally placed at the front of the church, rather than the altar or communion table. This placement of the pulpit is meant to emphasize the importance of preaching the Word of God. The Western Catholic Church and the Eastern Orthodox Church, unlike Protestant churches, have a hierarchy within the structure of the church. For both the Eastern and Catholic churches, areas are broken down into parishes. Each parish is staffed by one or more priests. In the Catholic Church, several parishes together comprise a diocese, which is overseen by a bishop. The College of Bishops together is believed to be the successors of the Apostles. Several bishops are selected by the Pope and are called Cardinals. The College of Cardinals advises the Pope and, at his death, elects his successor. The Pope is known as the "servant of the servants of God." The line of Popes began with Saint Peter, and each Pope since is believed to be a successor of Peter. He represents the head of the universal Catholic Church on earth, with Jesus as the High Priest. In the Eastern Church, the hierarchy is similar, with bishops overseeing parishes staffed by priests. However, in the Orthodox Church, the bishops belong to the Holy Synod, with an Archbishop, Metropolitan, or Patriarch as its local head, depending on the area. The Orthodox Church does not have a Pope or recognize the authority of the Catholic Pope. The Holy Synod is the governing body of the Eastern Orthodox Church. The Catholic Church is also unique in that it recognizes saints in a different sense than most churches. In most Christian denominations, a saint is any Christian who serves God, whether in Heaven or on earth. In the Catholic Church, however, certain persons are recognized to be so holy that they are canonized, receiving special recognition for their devotion to God. Contrary to a common misconception, it is not believed that saints have any special power or can answer prayers or solve problems. Additionally, Catholics do not worship saints as they do God. Rather, saints are held up as examples of following and loving God. They are venerated, and are understood to be kind of intermediaries. When praying to a saint, that person is not asking the saint to solve their problem, but to pray to God for them. An easy way to understand it is this: if you want to borrow your father's car, rather than asking him yourself, you have your mom ask him for you. Saints provide an extra pair of hands for praying. Stained glass and paintings at Ss. Peter and Paul Byzantine Catholic Church in Portage. The altar at Grace Lutheran Church in State College. 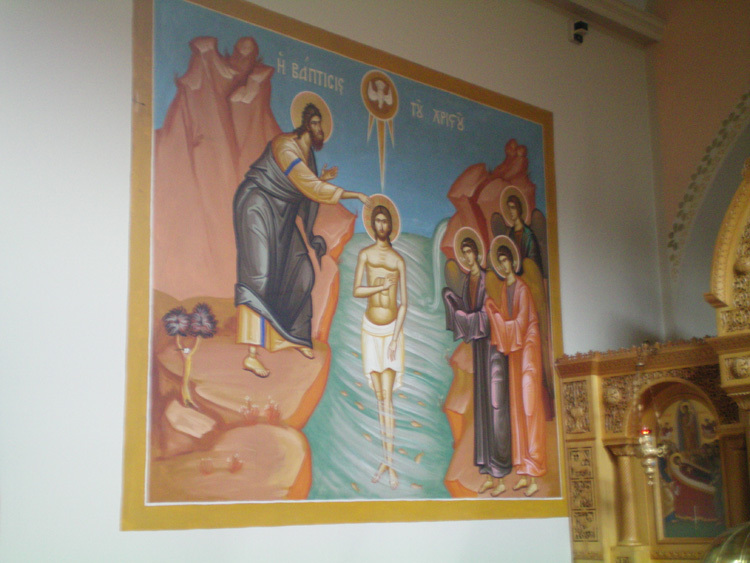 Painting of the baptism of Jesus at Holy Trinity Greek Orthodox Cathedral in Camp Hill. 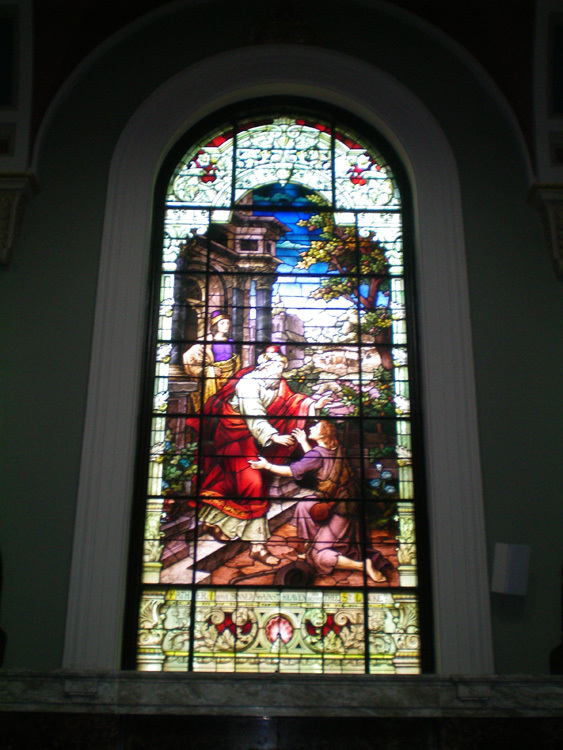 Stained glass window at St. Patrick's Cathedral depicting the parable of the Prodigal Son. 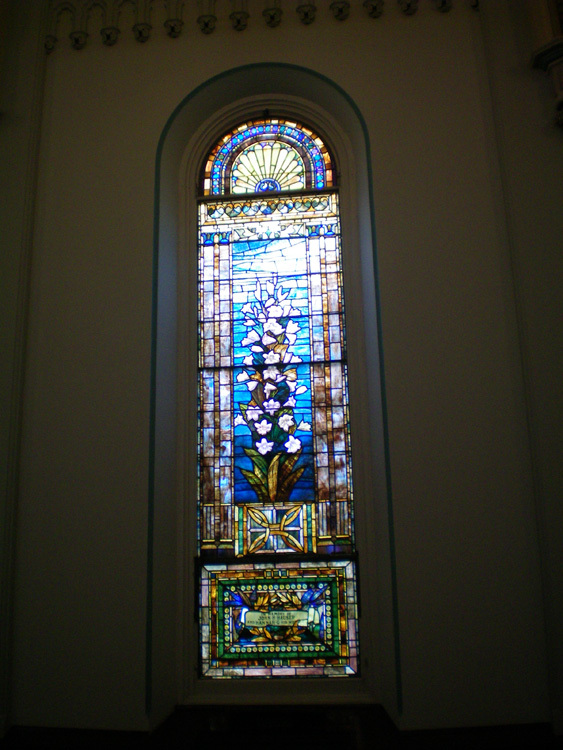 Stained glass window at First Presbyterian Church of York.